"I'm sort of painting myself out of a job," artist Anne Harris recently remarked to me during a telephone interview. In truth Anne's remarkable exhibition at Alexandre Galley -- "Phantasmatical: Self-Portraits" -- will likely make her job as an artist more secure than ever. The point that she was trying to make, with a dose of humor, is that the women who populate her recent works seem to be fading towards total disappearance. The gradual evanescence of Harris's imagery is occurring as a feature of what she acknowledges is a "long standing evolution." She confides that "over the years I have become more and more interested in the the idea that I am painting a slice of air." With that in mind, the majority of the works in the Alexandre show include the word invisible in their titles: "Invisible (Blue)," "Invisible (Pink Face)," "Invisible (Blonde)" and so on. There are oil paintings and drawings on paper in the show, and also a mixed-media work from 2007, "Invisible Girl," that was executed on both sides of a sheet of mylar. Inspired by a "sister" drawing on buff paper from 2006, Anne says that it is the starting point or "template" for the invisible series. It's done on translucent mylar. I painted the back of the mylar with a pale yellow watercolor: Naples yellow. Then I drew on the front with graphite, water color and oil paint. I think of "Invisible Girl" as a drawing because the ground -- the mylar -- has a prominent, active role. The thing that makes this drawing relevant, that gave me the idea for the paintings, is that the background, the space surrounding the figure, is opaque oil paint. The figure is mainly the translucent ground. The "modeling" at the edges is actually the shadow cast on the wall behind the drawing. Harris feels strongly that the thematic impetus and the improvisational spirit of her "invisibles" has to come from drawing. "I don't get so over-wrought and heavy handed with drawings," she explains. "I feel free to toss drawings, to throw them away. They're more open, more intuitive, pulled out of the ground, rather than layered as skin over the ground. Painting can bog me down, sometimes like a black hole; I'm trying to learn to paint the way I draw." Working to free herself up in technical terms has been a necessary ingredient that has allowed a greater range of expression and a multiplicity of new meanings to creep into Harris' imagery. I tend, inevitably, to veer toward the grotesque, although I'm never aiming for that. Really, my best paintings seem to happen between subtlety and the grotesque. These paintings, because they're more delicately made, the touch more evident, the range of color and value extremely close, they walk a line between subtlety and intensity that is... I hope, better, more powerful, maybe more beautiful, although beauty is another topic. I realize I'm trying to make a beautiful painting of a subject many won't consider beautiful. Anne Harris, "Invisible (Pink Face), 2011 - 2012, oil on linen, 33 1/2 x 30 inches Because the "invisibles" begin as self-portraits -- as do nearly all of Harris's works -- they certainly deal with self perception. 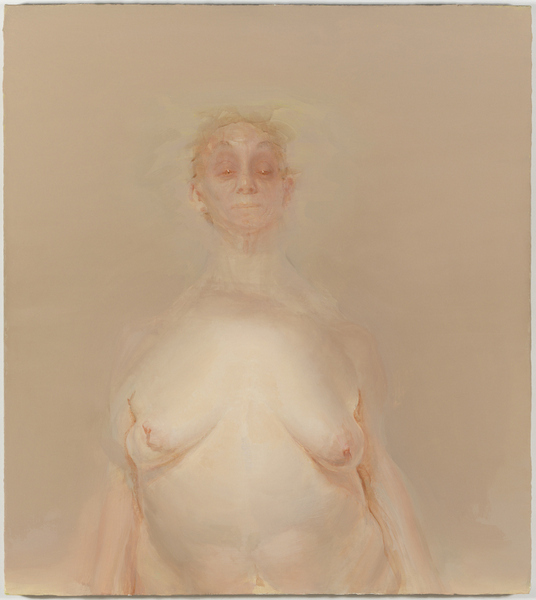 In an essay written for the catalog that accompanies this show, Alison Ferris, curator at the Kohler Arts Center, who has followed and studied Anne's work for many years, comments that the recent paintings display "the physical and emotional consequences of menopause for middle-aged women." 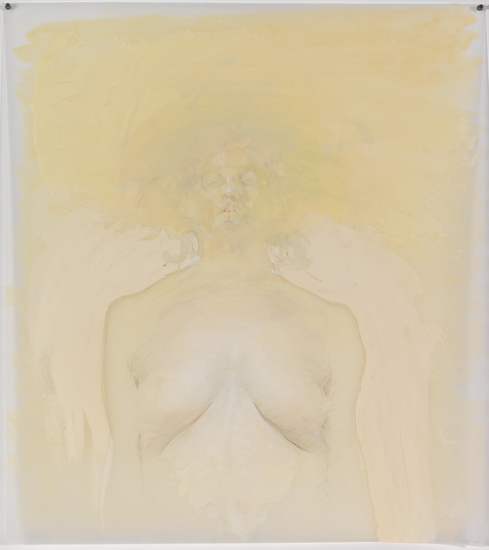 Harris, whose reputation as an artist was established by paintings that documented her pregnancy, is comfortable with that observation, but doesn't want it to constrain other possible meanings that her work might suggest. In a more general sense Anne's recent works explore a range of ideas about how others see us, how we feel about being seen, and how we gaze back. "How does it feel to be stared at?" is one question that Harris has thought through quite intensely. "At puberty the awareness happens and with it comes both vulnerability and power: it is kind of awful and kind of good. It's complicated. You can't just walk down the street and be yourself. You are defined by those looking at you." When asked how the sense of being looked at connects to the theme of invisibility, Harris explained that aging -- in both positive and negative respects -- is certainly part of the mix. "When I was younger -- and better looking -- I was much more anxious, more self conscious. Then the looks began to stop as my looks began to go, in my mid thirties, I suppose, after I had my son. I gradually realized that I was literally less potent, had less of the automatic force and impact that comes with youth, that I was disappearing and could only make myself noticed by being heard, but I was also more confident, more likely to speak up. And being invisible engages a kind of power, I could stare with impunity because no one was watching: previously, if I stared it was an invitation, and my default eye position was down. So I'm trying to paint contradictions: a visibly invisible painting, the feeling of being invisible and exposed, of being both less and more powerful." I tend to rely a lot on relative color -- "no-name" colors against "no-name" colors -- that push each other warm or cool, or colors layered over each other to create mixtures that are technically called half-tones or optical grays. The best way I can describe this is to use the analogy of blue veins as we see them through fair skin. Layers of skin lie over veins, the light passes through and bounces off, causing us to see, as blue, translucent vessels carrying dark red blood. Translucent layers of paint work this way as well. Emotionally, technically and stylistically Harris is walking a tightrope, and she seems genuinely thrilled to be there. Describing one of the "invisibles" to me on the phone, she tells me that, "the figure might have less weight than the air: I love trying to paint dense air. The entire painting becomes the body. It is exciting to me that everything is skin and air."